Here is a list of all those soft shoe shufflers who have added there little bit of magic to Texas Radio and the Big Beat. 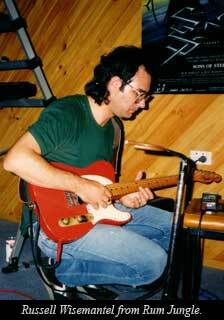 Mark Tinson has worked with the Radios engineering a few of their tracks and generously providing studio time in his own Overhead studios in Cooks Hill for the band. Tinno, as he is known to all and sundry, has been producing Newcastle bands for some time. He’s worked with local bands like Supersonic, Freakshop, Little Hornet and Shoot Lucy as well as mentoring many of Newcastle’s finest and successful rock bands, most notably silverchair and the Screaming Jets. As well as working on documentary and film sound tracks Mark has been strapping on his battered red L-series Stratocaster and plugging it into his crisp Vox AC30 for some time now. He’s burned down the glam rock road in the seventies with Rabbit and had a sizable hit with the Heroes in the eighties. They were signed to Alberts records and Tinno had the pleasure of working with Harry Vanda and George Young on that project. He toured with the legendary Ted Mulry Gang right through the nineties and he’s been the main songwriter for notorious Festival records country-punk act the Tex Pistols. Their first album Never Mind the Bullocks has become a hard to find collector’s item. Myths like his don’t come much bigger in this city. Peter Edmonds, who has played bass with Lip System, Men Without Shame and now with An Inkling http://home.kooee.com.au/aninkling/ sat in on bass for some of the Radio’s Sydney dates. Pete is always a pleasure to work with and, in the opinion of Johnnie Clott, is the best unsigned songwriter he has ever heard. Tony Cause, who also plays mighty guitar and mighty mighty keyboards, played sax on I Need Your Love and Michael Punch, who had the best line in political rhetoric when he worked with Punch Heads and Bolt (the best named band on the planet), played the guitar solo in the same song. 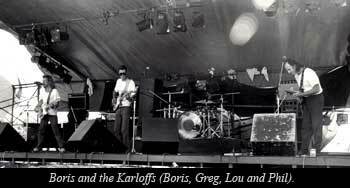 Boris and the Karloffs provided the basis of the recording of Paris Island. The Karloffs worked on the North Coast of NSW from 1985-1988. The band included Chris 'Boris' Melville (g/v), Phil McIntyre (g/v), Dave Mackie (b: 1985-86) and Steve Pearson (d: 1985-86). Greg Wallis replaced Dave Mackie on bass in 1986. Greg was part of Brian Cadd's touring band in the early seventies and he played bass on the Paris Island recording. Lou Alesandros replaced Steve Pearson at the same time and his nifty drum work can be heard on the same track. Dave Mackie was formerly bass player with The Trouble Boys and went on to work as an engineer at Trafalgar Studios in Sydney recording albums with The Hoodoo Gurus and Paul Kelly. Bob Spencer is a former member of Skyhooks and the Angels. He played a recording date with Texas Radio and you can hear his solo on the track Ride on Through. The members of Rum Jungle also featured on the recording of Ride on Through. Peter Mackie was on bass and Russell Wisemantel played the ever so Keith Richards style riffs, as well as the first guitar solo, on the tune. Tony Heads and Heather McIntyre played organ and piano, respectively, on Hope and Glory. Heather has been playing keyboards since she was four and can read sheet music at a thousand paces. Tony Heads is a local legend. He played in charting bands in the sixties such as the Velvet Underground (no relation!) 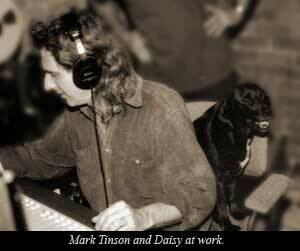 and has been playing live and producing and engineering recordings ever since. He owns and operates keytone studios in Maitland which replaces the famous Cordial Factory studios as his main arena of digital activity. Vladimir Pavlovic, a most charming man deserving of accolades and superlatives for his cosmopolitan approach to life, supplied his nimble fingers for the classical guitar parts on Temptation. John Doyle produced the sizzling Harrisonesque solo on the same song and also laid down the second guitar part. Tinno put down his red Strat and took on the cello parts. Ric McCann, now playing with acoustic grunge band Garland http://www.mp3.com.au/artist.asp?id=18364 played drums on a number of tracks on Texas Radio’s album as well as sitting in for a few live dates when Dave was occupying the drum stool for other bands. 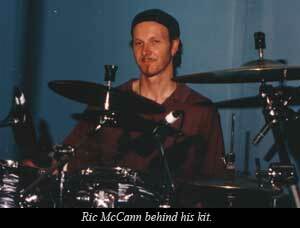 Ric is a gentleman and a scholar as well as a very very fine drummer. 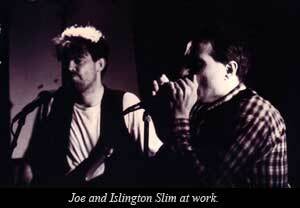 Islington Slim (aka Robert Alcock) is a blues harp player extraordinaire who played live with Texas Radio when he was available and recorded the harmonica solo on No Mystery. Robert is also a filmmaker and works at SBS television. Ben Ewald has sat in on saxophone a number of times with the Radios. He normally plays with Le Minibus, a roots band who specialise in a mixture of European Gypsy music, French tracks and tangos, Greek, klezmer and American jug band music. Ben also plays Soprano Sax, Alto Sax, Flute in the the jazz trio It's Time which started as an off shoot from Le Minibus. They play swing standards, latin tunes by Jobim, modal explorations from Miles Davis, a few oddities from Theolonius Monk, a song or two, and a couple of calypsos thrown in for fun. Dave Appel also handled the sax chair a few times at the Lass O'Gowrie bringing a touch of rock and roll to the instrumental dance spectacular 'Kiss Me' and, as Mickey Rumble worte, 'added a new depth to a number of the now familar Texas Radio tunes'. Andrew McIntyre was the original drum merchant for Texas Radio. He sat in with Joe and Phil when they were getting it together literally in the garage all those years ago. He was also the lighting guy for Boris and the Karloffs and fronted punk act Tex T Book and the Scribblers. Along with the crew of Dave Ball, Mick Polglase and Anthony Moore, he deserves a massive set of thank yous and praise for the sound, the lights and the lug out. The photos were taken by Gerard Wilson, Julie McIntyre, Dave Gollan, Chris Ruggles, Peter Mackie, Phil McIntyre and Joe Velikovsky.